He can say that again. The first season premiered in the fall of 2005, and the third concluded almost three-and-a-half years ago. The series was always erratic, which is a common condition among shows that are dancing through minefields, but at its best it produced some of the sharpest satire on TV—and it was always McGruder’s baby. Based on a small sampling of upcoming episodes, the new season is a copy of McGruder’s baby made from a printer that needs a fresh ink cartridge. The clear, hard lines of McGruder’s vision and sensibility aren’t the only things that are a little faded. On a show like this, the freshness and relevance of the satirical targets counts for a lot, and three-and-a-half years is a lifetime in popular culture. So it’s not altogether encouraging to tune into the new season and see Robert “Granddad” Freeman (still voiced by the prodigious John Witherspoon) barreling through a desert landscape in an RV while stripped to his underwear and wearing a gas mask. 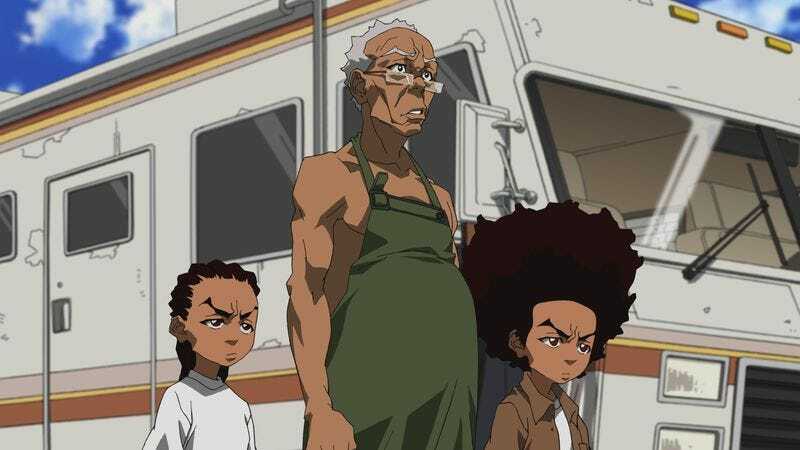 It’s a reference to Breaking Bad, a television program that played out its entire five-year run between the end of The Boondocks’ premiere season and the start of this one. Season four of The Boondocks is a lot like that scene in David Cronenberg’s The Fly in which Jeff Goldblum confirms that he hasn’t yet programmed his teleportation device to fully grasp the intrinsic qualities of flesh. He teleports a steak, and what comes through looks like a steak but tastes synthetic, not quite right. 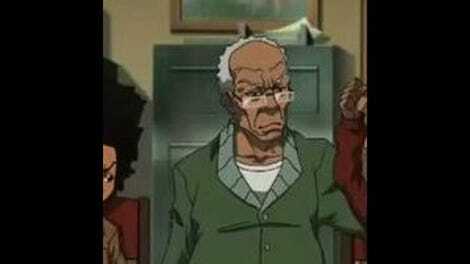 The new Boondocks looks and sounds like the old Boondocks. But only one of them came from the real cow.